Obituary – Neiman, Jacop « Perry High School Alumni Association, Inc.
Jacop Neiman, 57, 5 Cedar street, died at 11:56 p.m. Monday at Enid Memorial hospital. Funeral will be at 2 p.m. Thursday at Brown Funeral chapel. Burial will be at Grace Hill cemetery. 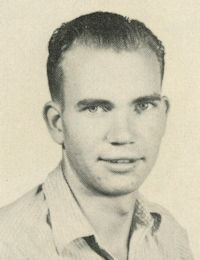 Neiman, the son of Wold and Margaret Neiman, was born at Perry, June 29, 1929, He was a 1948 graduate of Perry high school and was married to Wanda Williams on Nov. 18, 1957. He was an employee of Charles Machine Works the past 15 years. Neiman was a Baptist. In addition to Mrs. Neiman, of the home, survivors include one daughter, Debra Clark, Perry; two sons, Steve Neiman, and Dale Neiman both of Perry; a sister Thelma Harlan, Perry; and three grandchildren.